A story from Day Four of Black Lives Matter Week of Action in Schools. Early childhood students and families at The Inspired Teaching Demonstration School began to work on a #BlackLivesMatter mural this morning. 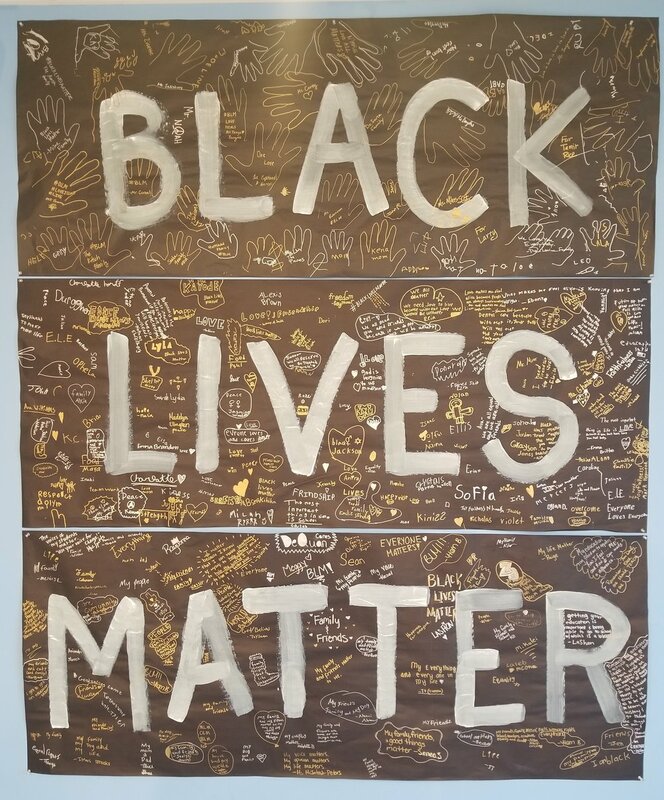 Students in Pk through 8th grade will have the opportunity to add their messages throughout the week as part of the D.C. Area Black Lives Matter Week of Action in Schools. All year long, we strive to be intentional and culturally responsive in our planning and instruction. During Black Lives Matter Week of Action in Schools, we have the opportunity to further recognize and celebrate people that have been systematically marginalized and oppressed for the color of their skin. People of color are important, essential members of the ITDS community. We are creating a Black Lives Matter mural for our school, with each floor in the school contributing to one word of the sign. Our elementary and middle school students will spend time unpacking their word in isolation and within the context of the statement Black Lives Matter. Here in early childhood, we have the word “Black.” We spend lots of time talking, exploring and learning about colors, through art, play materials, and within the context of all the beautiful shades of our skin. We wanted to invite families to explore and discuss the word “Black” in whatever context feels right for you. It can be as simple as where you might see this color, or as complex as injustices that Black people have suffered. We recognize that the ability to process and communicate ideas around race varies from child to child and family to family, and we wanted to honor these differences by allowing families to discuss and interact with this banner in the way that feels right for each of you. Any families that feel so moved are also invited to add a handprint or a written name on the banner. Later this week, all three words will be joined to create our Black Lives Matter mural, in celebration of our week of learning. Why are we having Black Lives Matter Week? Sometimes people say and do hurtful things to people due to the color of their skin; our school community is speaking up to say that’s unfair. Why are we wearing hoodies? Sometimes when people wear hoodies, other people think that they’re scary. But we know, whatever you’re wearing, you’re still the same wonderful person and you matter. Creating this banner, and planning other activities or discussions for this week was a point of struggle and debate for us as early childhood educators and advocates. Young children interact with society, and are exposed to upsetting and concerning events every day, but within different contexts, and with varying degrees of comprehension. They are active participants and observers of the world around them. As teachers, we are often called upon to discuss difficult ideas and help children process them, and as individuals, we each have different feelings and viewpoints on when and how to engage our young learners when complex topics surface. We had a number of discussions and debates, representing a wide range of perspectives. As a result, we agreed on the importance of talking about this with young children, reaching consensus on the following key points. We build the foundation for a more equitable future by celebrating our differences, including skin color. We do this all year long through thoughtful planning and in response to teachable moments that surface in our classroom communities. Families will have many different feelings about issues surrounding race and the Black Lives Matter movement, and should have the opportunity to discuss these ideas with their children in their own way. Children need to know they are safe and loved and they matter. It is important for them to not be completely sheltered from painful things. Social issues are early childhood issues. We’re all still learning about and processing this kind of work with young children, and striving to do what’s best for our students and our world. Thank you for your partnership and understanding in this work.